Take a break from meat with a helping of heart-healthy fish. Any firm-fleshed white fish will do for fish tacos. 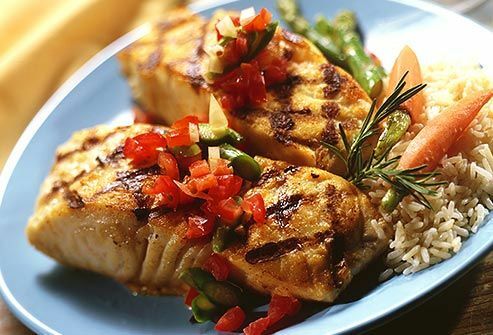 Pick your favorite cooking method: Marinate your fillets and broil or grill them, or give them a quick milk bath and dredge in flour to fry in a little oil, or even microwave. Lay the fish on a warm corn tortilla and top with shredded cabbage, fresh salsa, and a squeeze of lime. 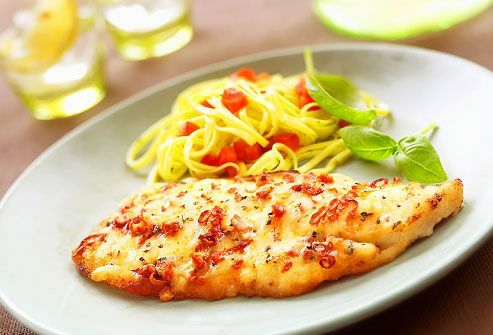 Leaner fish like cod and sole will shrivel if cooked with dry heat, but they are good for poaching and other moist heat cooking. 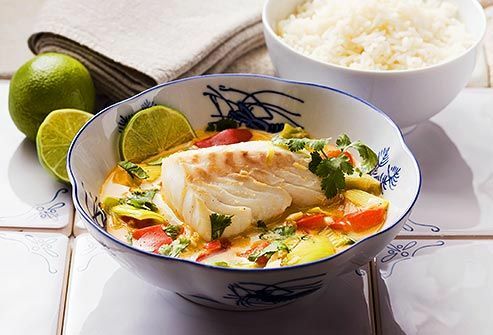 Gently simmer chunks of lean fish in low-sodium chicken or vegetable stock with a touch of coconut milk and Thai curry paste, along with sautéed veggies like zucchini, eggplant, and mushrooms, for an easy weeknight dinner. Tangy tomato sauce spiked with olives, garlic, and peppers is perfect for this mild fish. Marinate and pan fry it, or cover it with sauce and bake in a 350 degree oven 15-20 minutes, until fish flakes at the touch of a fork. Frozen fillets are fine. In fact, when it's been flash-frozen at sea, frozen seafood may be fresher than the fillets on display at your grocery. It may sound fancy, and it is when you use the traditional paper packet. 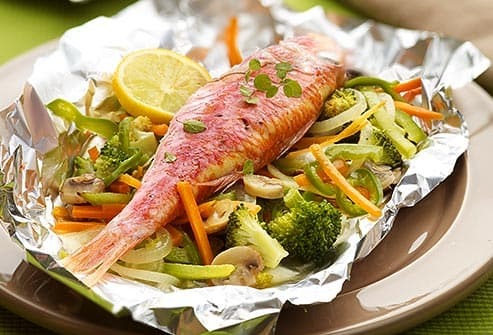 But cooking up fish in foil is simple and quick. Just tuck each portion into a foil pocket along with olive oil, the seasoning of your choice (lemon and garlic are always good), and some veggies. Seal it up, leaving a little room for steam, and pop it in the oven. Super-fresh ingredients are the key to this no-cook Latin American dish made from fish and shellfish marinated in lime juice. Onion, pepper, garlic, and cilantro are traditional, but avocado, mango, or even watermelon and mint can work well, too. 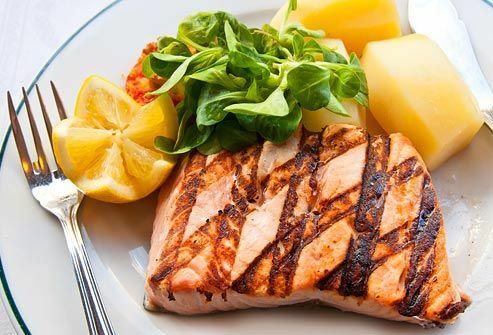 The acidity of the citrus fruits safely preserves the seafood. 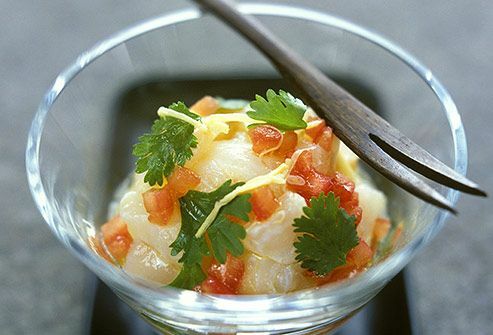 But if you don’t want to eat raw fish, try a "mock ceviche" recipe. 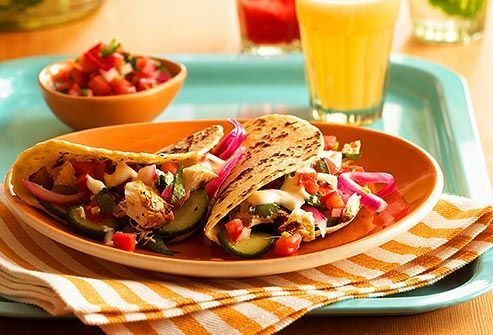 Fresh salsa -- whether it’s made with tomatoes, peppers, and onions, or even mango spiked with red onions and cilantro -- makes a super-easy, tasty topping for grilled fish. This hearty fish is good for grilling or broiling. And a simple marinade -- like soy sauce, honey, and ginger -- punches up the flavor. Be sure to take salmon off the heat while the center still looks slightly see-through. It'll keep cooking for a few minutes on its own. Less is more when it comes to cooking fish. Whip up a quick next-day meal with your extra grilled salmon. 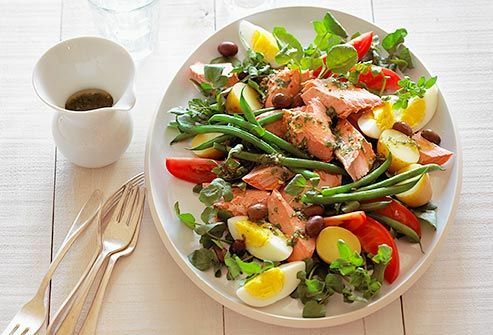 Toss it with flavorful low-calorie ingredients like lemon, red onion, and dill. Serve it on a bed of lettuce and fresh veggies, or sandwich-style with tomato or cucumber slices on bread. It stands in nicely for tuna -- and canned salmon can work, too. Scallops cook up super-fast when pan seared for a golden, crispy crust. Serve them immediately with the sauce of your choice -- or just a tiny drizzle of butter -- for the best taste and texture. 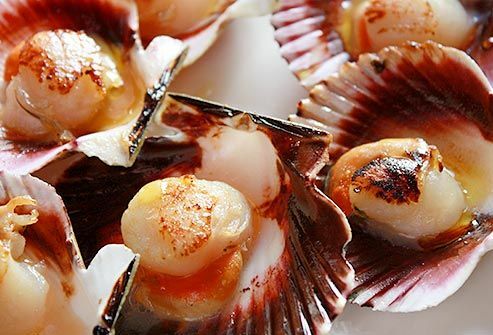 Fresh scallops should smell sweet, not fishy. Steam fresh mussels with shallots, a hearty beer, cayenne, honey, and horseradish for a rich yet frugal feast. 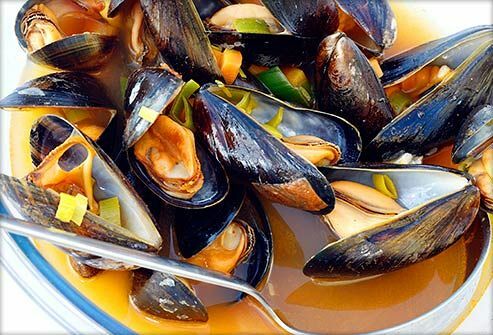 Shellfish, especially mussels and clams, are a cheap form of protein. 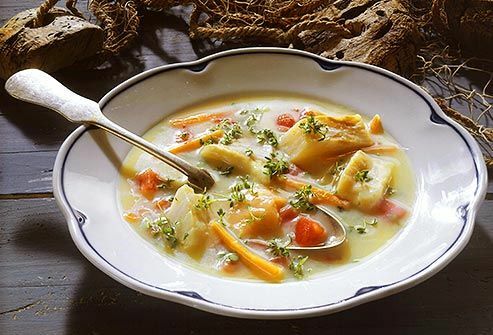 Creamy fish chowder can be quick and calorie smart, too. Lighten it up by using milk instead of cream. Sauté onion and celery until soft, add milk, clam juice, and potatoes. Once potatoes are soft, remove some with a slotted spoon and puree in a blender with some of the cooking liquid, then return it to the pot. Add fish and simmer until done. 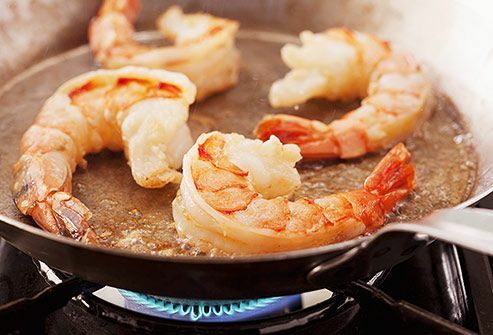 Sauté some garlic in plenty of olive oil, then turn up the heat and add shrimp and seasonings. Cook just until they turn pink. This protein- and mineral-rich dish comes together even faster if you use peeled shrimp. For a speedy Shrimp Fra Diavolo, transfer the cooked shrimp to a plate, and in the pan sauté onions, wine, tomatoes, and oregano. Then add the shrimp back to the pan. Make friends with your fish seller, and make sure he or she knows where your fish was caught. When you’re buying a whole fish, look for one with clear eyes and tight, shiny scales. But the most important way to find high-quality fresh fish is to follow your nose. 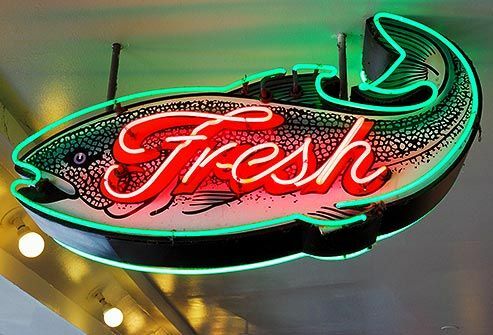 Fresh ones should never have a strong, fishy smell. Suzanne Rostler, MS, RD, Framingham, Mass. Jennifer Hill, RD, recipe developer and food specialist, Vancouver, British Columbia. Katie McCammon, MS, RD, chef and health educator, Killeen/Temple, TX. Becky Salengut, private chef, author, and cooking teacher, Seattle. American Heart Association Scientific Statement: "Fish Consumption, Fish Oil, Omega-3 Fatty Acids and Cardiovascular Disease." United States Department of Agriculture National Agricultural Library: "Crustaceans, shrimp, mixed species, cooked, moist heat." Monterey Bay Aquarium Seafood Watch. Salengut, B. Good Fish: Sustainable Seafood Recipes from the Pacific Coast, Sasquatch Books, March 29, 2011. "How to Cook Everything," Mark Bittman.